The Amtryke brand therapeutic bicycle. Brendon surrounded by family and friends that made his bicycle dreams come true. 8-year-old Brendon Johnson takes a victory lap around the Vern Riffe gymnasium. For many, the phrase “it’s like riding a bicycle” is attributed to things one never forgets how to do. But for 8-year-old Brendon Johnson of Portsmouth, riding a bicycle is something he’s never done. On Wednesday, a collaborative effort undertaken by several different local organizations resulted in Brendon being presented with his very own bicycle designed just for him. Paige Morris, a therapist at Nationwide Children’s Hospital, contacted the Portsmouth Kiwanis Club and gave members information about an opportunity for assisting in funding of a therapeutic bicycle for Brendon, who was diagnosed with cerebral palsy and microcephalus at birth. Kelly Johnson, Brendon’s mom (and grandmother), continued the communication with Kiwanis and piqued the interest of Sharon Carver, secretary of Kiwanis Club of Portsmouth. The information was presented to Kiwanis board members, who recognized it as a wonderful opportunity to make a difference in a little boy’s life. Aside from performing the assessments necessary for individualizing the bicycle, Morris was also able to register Brendon with a nationwide group called AMBUCS, which adds children’s names to a wish list. Amy Zimmerman and Sandy Zimmerman assisted the local Kiwanis in the project and Greenbucs, a Kiwanis Club that has a special relationship with the company Amtryke, which manufactures therapeutic bikes and was able to provide a 40 percent discount on the purchase of Brendon’s bicycle. 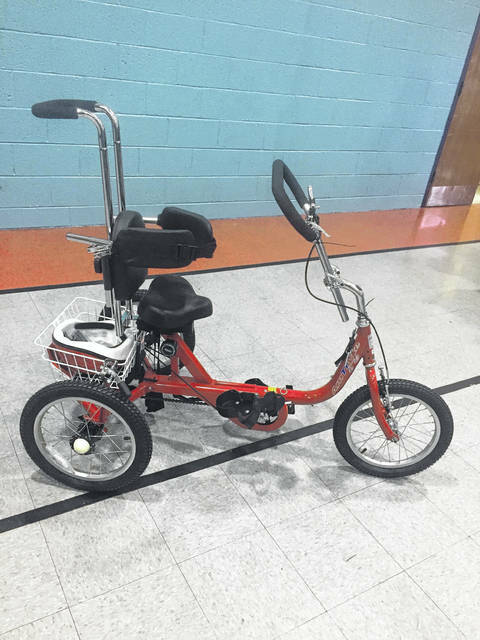 At a small ceremony in which Brendon was presented his specially made bicycle, Trish Schmidt, Vern Riffe School therapist who has worked with Brendon since he was 3 years old, emphasized how the bike will help Brendon improve his motor skills. Luanne Valentine, Kiwanis Club of Portsmouth president, spoke on the collective efforts of several different Kiwanis Clubs to make the bicycle purchase possible. 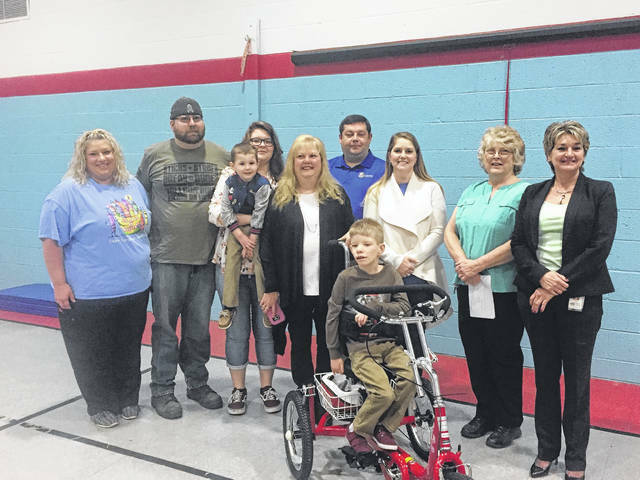 Brendon’s bicycle became a regional project, with contributions from Jackson, Lucasville, Ironton and two Kiwanis Clubs in Athens. Kelly Johnson thanked everyone involved in the project, and expressed her appreciation and gratitude for all the hard work. Johnson said a special thanks to Sharon Carver, who became extremely invested in the project. “I want to thank you, Sharon, from the bottom of my heart for making my little boy’s dreams come true,” Johnson said. Johnson explained that when Brendon passes a bicycle in a store, he often will reach out for one and express a great deal of interest, but his diagnosis makes a tradition bicycle impossible for him to use. 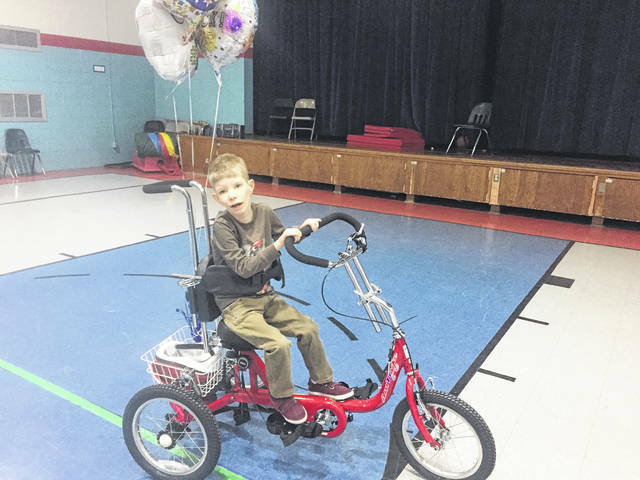 After all the thank yous were exchanged, Brendon took his bicycle on its first ride for a victory lap around the gymnasium of the Vern Riffe School.